Ervin Fopma and Wesley Van Wyk formed Earth Works Inc. January 1, 2001 to provide professional excavation services for Central Iowa. Both owners had previous experience in excavating. Ervin since 1987 as owner of Sully Plumbing and Heating, Inc. and Wes since 1966 when he worked for Lawrence Maasdam, and later as owner of Sully Construction, Inc.
Earth Works Inc. has developed into a full service excavation company with many experienced, trusted employees. We are recognized for our attention to customer service and commitment to excellence. It is our goal to find a way to meet any customer's needs - large or small. Through continuing education in technology and safety we provide a cost effective solution to any excavation project. 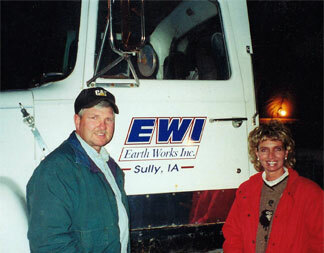 In late 2010, Wes and Sheryl took full ownership of Earth Works Inc. They appreciate the relationships and friendships that have been formed through the years, and anticipate working with both existing and new customers.